Buying a new device is only half the fun. Adding accessories is the other half. Three ASUS produced accessories are coming for owners of the new Google Nexus 7 starting with a travel cover, available in 6 different colors. The cover is made from a durable polymer to protect your investment from the usual plagues that affect mobile devices such as a case of butterfingers. 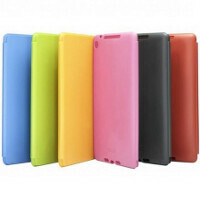 The case can be purchased in orange, yellow, blue, pink, green, and dark grey. Another accessory is the premium case. What makes it premium? Well, it changes into a stand to prop up your Nexus 7 so you can get a better view when you're watching our product reviews on YouTube. The premium case is made from microfiber and polyurethane. The combination will help protect your Nexus 7 from the elements, and more importantly, from yourself. Finally, those buying the new Nexus 7 can protect the 7 inch screen with screen protectors. Each package contains one matte protector and one glossy protector. It comes with a cleaning cloth and a squeegee to help with the application. I was looking to go Otterbox, or maybe a case with a cover that doubles as a keyboard... however, just may have to cover/stand case a look-see too. The dark grey and the red are just calling to me. If these are anything like the ones from last year, they're not going to be so great. Too much plastic for $30, for a little more I could get a cool Treegloo or two from Amazon or eBay. These are a little too candy colored for me to take to work.